I know what you are thinking: A turkey? Really? Yes, really. The painting of this little bird was possible due to the work of Jean-Jacques Fougère Audubon, born in Saint-Domingue, place we now know as Haiti. Despite he was born in that island, he was raised in France, his parent’s country. 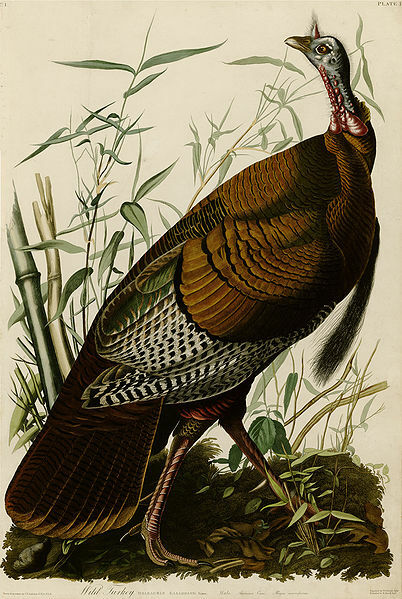 From a young age, Audubon shows great interest in nature and, above all, in birds; fascinated by their elegant movements and their colorful plumage. Thus, he spent most of the time outdoors, wondering in the forest and, usually, coming back home with little curiosities like bird eggs and nests, which he drew. His father, trying to avoid his son to be enrolled in the army during the Napoleonic wars, gets him a fake passport and makes him emigrate to the USA, more specifically, to a farm in the state of Pennsylvania. There, he changes his name anglicizing it to John James Audubon. Imagine what it was for a nature lover to move to a farm: the only he would do was walking, fishing and hunting. He discovered, along with his neighbor, a new world, filled with new animals and plants, different from the Europeans. Because of that, he decided to start studying painting formally, as he wanted to portrait his new discoveries with more realism than others did. Simultaneously, he kept with his mania to collect nature souvenirs and his room was filled with bird eggs, fish, snakes, stuffed raccoons and any other creatures he thought of. After a while, Audubon set himself a goal: to surpass the ornithological work of Alexander Wilson. With this goal in mind, he started to portrait birds, trying to complete a painting a day. The technique to do it was, first, to hunt the bird. Once dead, he would tied it with wires trying it to look natural and then, paint it at his own pace. But besides the animal, Audubon always tried to portrait, next to it, the flora that surrounded it, because he thought that an animal could not be portrayed if it was not along its surroundings. Then, he wanted to publish his bird drawings but he was quickly rejected. However, a fellow student from his oil painting workshop, amazed by the drawings, recommends him to take his work to Europe. Audubon agrees and, with his portfolio, ships to England in the year 1826. He was 41. In there, Europeans are amazed by the paintings: after 14 years of work, he could finally publish his book Birds of America, a collection of 435 color drawings of American birds, which were exotic to the European eye. The book, although it was a hit, was printed by parts, due to the fact that printing it completely cost USD115.000 of that time, which is equivalent to USD2.000.000 now. ~ by Álvaro Mazzino on July 20, 2010.
will yield the land owner $2,400 per acre. This entry was posted on July 20, 2010 at 16:21 and is filed under Uncategorized.You can follow any responses to this entry through the RSS 2.0 feed.You can leave a response, or trackback from your own site.